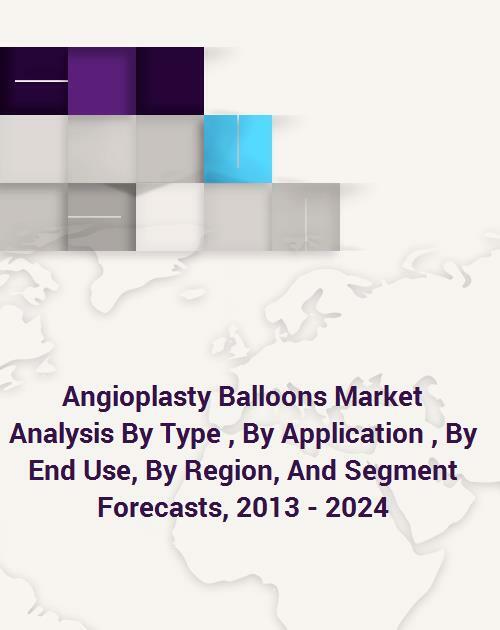 The global angioplasty balloon market is expected to reach a value of USD 2.9 billion by 2024. The growth of the market is attributed to favorable government policies, approval & commercialization of several angioplasty balloons, and increasing coronary & peripheral interventions. Angioplasty is a minimally invasive procedure, hence patients and surgeons prefer this procedure over high cost stent placements. Furthermore, advancements in the angioplasty balloons are likely to propel the market. For instance, in December 2014 Medtronic plc received a U.S.FDA approval for their drug coated balloon IN. PACT Admiral for the treatment of peripheral artery disease. Approval and commercialization of cutting and scoring balloons, such as Flextome, AngioSculpt, TREK and MINI TREK balloon, rising adoption of new balloons, and lower cost as compared to stent placement are likely to drive the market during the forecast period. Normal balloon segment dominated the market in 2015 due to low cost and favorable U.S. FDA policies. Its ability to treat coronary artery obstruction is further expected to propel the market growth. Drug-eluting balloon segment is anticipated to be the most lucrative during the forecast period. This is attributed to increasing investment in R & D by major players and lower restenosis rates. Coronary balloon dominated in 2015 and is expected to maintain its dominance during forecast period. This is due to rising incidence rate of coronary artery diseases around the globe. Peripheral is the most lucrative segment owing to launching of new peripheral products in recent years. Market players are in a process of introducing newer products with increased efficiency. Ambulatory surgery centers dominated the end use segment in 2015. They accounted for the highest share of the vertical as they help minimize the medical expenses and hospital stay. Regionally, North America dominated the market in 2015 and is expected to maintain its position during the forecast period due to local presence of major market players and high cost of devices as compared to other regions. Asia Pacific is anticipated to be fastest growing segment during the forecast period due to rising healthcare expenditure, growing investment of key market players in the region, and high patient population. Some of the market players operating in the industry are Abbott; Boston Scientific Corporation; Cardinal Health (Cordis); Cook Medical; C. R. Bard, Inc.; ENDOCOR GmbH; Medtronic; Spectranetics; and Johnson & Johnson. 8.5 C. R. Bard, Inc.